It’s not surprising that, given the focus on Hermès over the past week, I’ve had questions about what man’s bags they have and where they can be obtained. 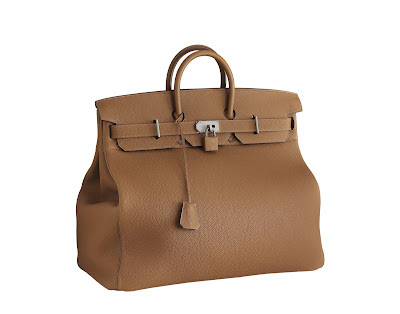 Hermès bags are often made in small quantities because of the difficulty in sourcing precise leathers. There is, however, a good range out there – and while stock varies from store to store, it is always worth asking staff what else is coming in soon and what other nearby stores have available. The range varies from canvas tote bags at the cheaper end to the Haut à Courroies saddle bag (top). This latter is a favourite of mine. 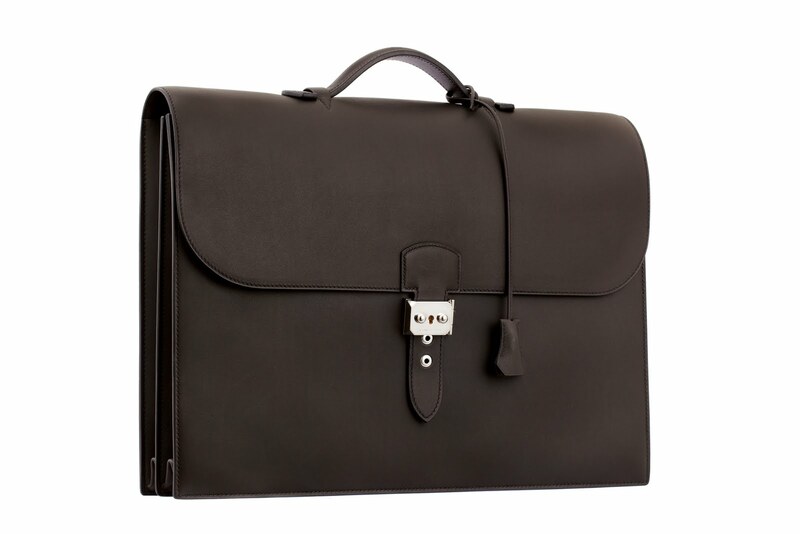 The first bag Hermès ever made, it was designed to carry a full riding saddle and would usually have been carried open. 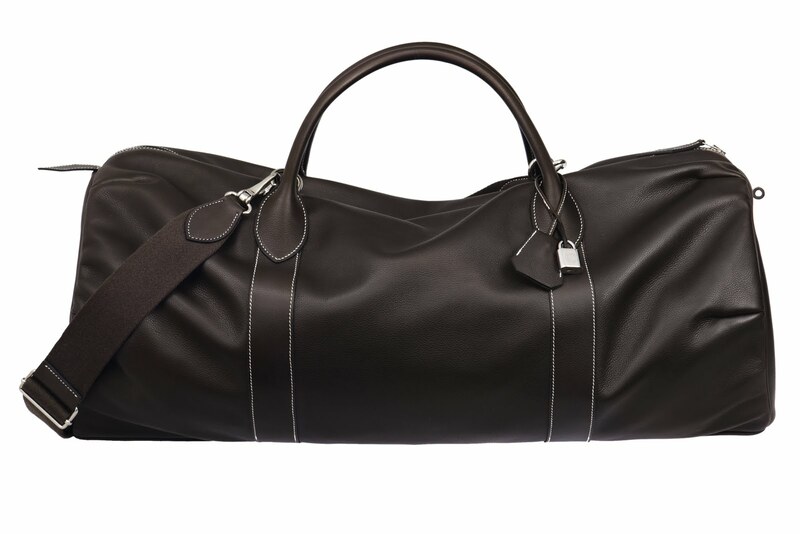 It is now a great weekender bag, and has been redesigned slightly to reduce its weight. The leather lining didn’t matter so much when you had a full leather saddle inside, but it is more important for weekend trips. So a thinner and foamed Togo leather is used, a canvas herringbone lining and aluminium hardware. This new version is called the Helium, after the ultralight chemical element (£7440). The other bag I would point readers towards is the new Sac a Depeches (pictured above, £4400). This is a very simple workbag in calfskin, but with all the Hermès details that lend sophistication – the wonderfully finished edges, as we explored in the first post in this series, and the balance of the whole. In fact, a concertina structure like this is particularly hard to make by hand, because if the balance between the folds is just a little bit off then the bag will not stand up straight. It’s a nice way to test a bag. Both are deliberately only available in quite masculine colours: the Haut à Courroies in tan and charcoal; the Sac a Depeches in ebony and charcoal. The matte calfskin of the latter has the added advantage that it will scratch and age quickly, giving it a very aged, gentlemanly quality. Also worth a mention is the Polochon Voyage (£5400, below), an old archive piece from the 1930s that was reissued in 2010. In evergrain calfskin, it is a new addition for Autumn/Winter. If you thought the other models were extravagant, this is essentially a sports bag, but made with the same miniscule attention to detail. It is also made inside out, like some versions of the Kelly handbag, before being reversed. So some of that lovely stitching is on the inside. You can follow the discussion on Hermes: The bags by entering your email address in the box below. You will then receive an email every time a new comment is added. These will also contain a link to a page where you can stop the alerts, and remove all of your related data from the site. They’re all very fine bags, though I don’t really like the look of the third one. I’m sure you’ve heard it before, but £7440 is very steep for a bag. Maybe it is a hand-made quality item, but it’s for a small number of people with a lot of disposable income really. No-one on a normal salary can afford to accessorise at that cost. I have a Swaine Adeney bag (this one:http://www.swaineadeney.co.uk/products/camb24_h/index.html) and it cost me 450 euros, mint second-hand, at a time when money was less tight. It’s only £1255 new. I don’t know how far a Swaine-Adeney bag stands up to Hermes, but at the price difference I’m happy to chance it. Swaine Adeney bags that are handsewn are among the very best Roger. I congratulate you on your bag. I think the differences are small ones. For example, I have an Alfred Dunhill bag that is handsewn and costs around £2000, but it is not all leather (some canvas), the leather used is not in as many layers and it is not like the Hermes grain leather they use. But then, the higher the price the smaller the differences become. I couldn’t agree with Roger more. Beautiful objects though they surely are, the price is totally ludicrous. Have been following your blog for some time after Russell at Graham Browne alerted me to it & appreciate the quality of the journalism. I generally think there are diminishing returns in terms of spending more on stuff (once you get past a certain point, obviously) and you’ve seriously got to have a lot of spare capital to spend £7k on a weekend bag. Plus I might be being a bit gauche here but the last one doesn’t particularly seem to have the air of an item which costs as much as a small car. Leaving aside the very significant price difference, in your view how do these compare to the bag by Bown which I think you also own? 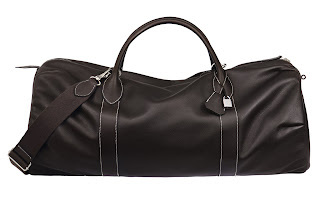 I’ve had my eye on the Bown bag for some time but have not yet hit the purchase button. Does it open sufficiently wide and have enough space to carry around an extra suit for a weekend? I think that’s a fair comment on diminishing returns. Or, to put it another way, the relationship between extra quality and cost is often exponential. Baby cashmere is only a couple of microns finer than adult cashmere. But you can only harvest it for one year in a goat’s life, rather than every year for the adult wool. So it costs three or four times as much. With bags like this the reasons are often around the rarity of leathers and of craftsmen good enough to work them. And if there aren’t many out there, you have to start your own school, which increases costs. However, Hermes spends far less on runways etc and more on craft than any of its luxury competitors. I know where I’d rather put my money. I think the Bown bag compares favourably with these. Not quite the same calibre, but still wonderful. Not really room for a suit though. Few soft weekend bags will have. Just to let you know that the Sac a Depache is now available in variety of colors including Hermes Rouge, Electric blue, Chocolate brown etc. Simon, I thought you may be interested in this piece (depending on how good your French is)!